If you think advertising on Facebook is just boosting posts, keep reading. click the blue “Boost Post” button on any organic post from your business’s page. Then, you can select your target audience based on geography, age, gender, and interests. Finally, you choose your ad’s duration and budget—the more you spend, the more people your ad will reach. Once you click “Boost” and your ad is approved by Facebook, your boosted post will appear in the news feeds of those you targeted. This is a great way to get a little more attention for one of your posts. But what if you want more than that, like website traffic or leads or video views? That’s when you need to graduate from boosted post and take your Facebook advertising to the next level. 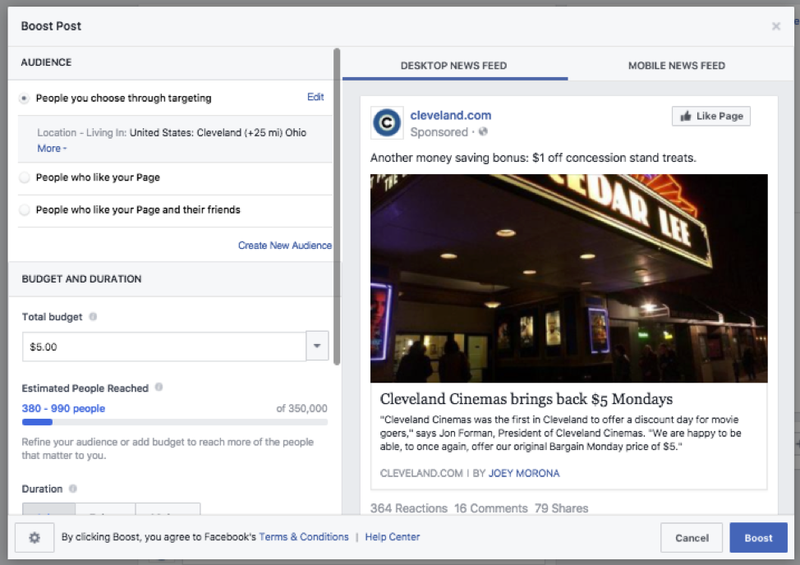 So, what’s the difference between boosting a post and other Facebook ads? “Boost Post” is Facebook-speak for “optimize for engagement”, meaning your ad is served to members of your target audience who are most likely to comment, like, share, or click on your ad. With Facebook Ads Manager or Power Editor, you have many more optimization options, like brand awareness, website clicks, lead generation, and app installs. Chances are, these other objectives suit some of your business goals better than engagement. Boosted posts run in Facebook’s desktop and mobile news feed. 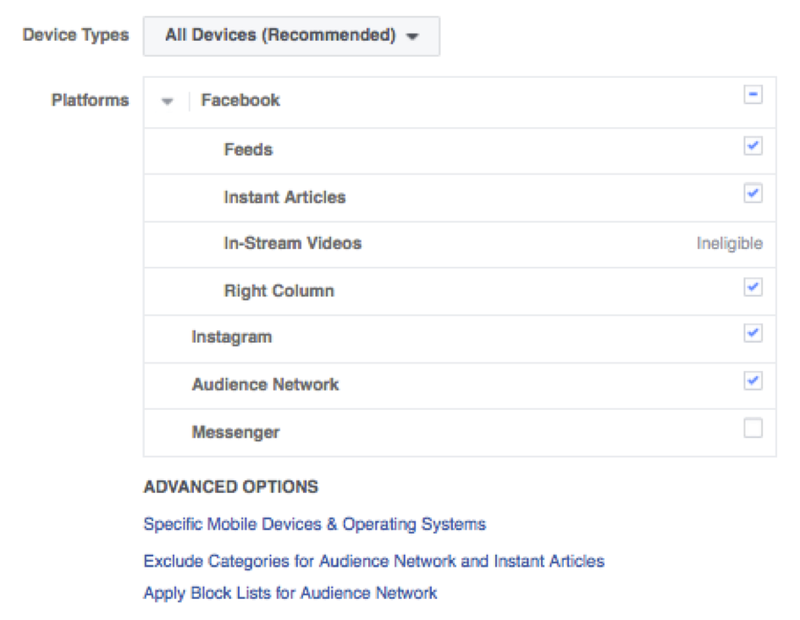 Ads booked through Facebook’s Ads Manager or Power Editor run there, too, but also run in Facebook Instant Articles, Facebook’s desktop right column, Facebook Messenger, Facebook’s Audience Network, and Instagram. 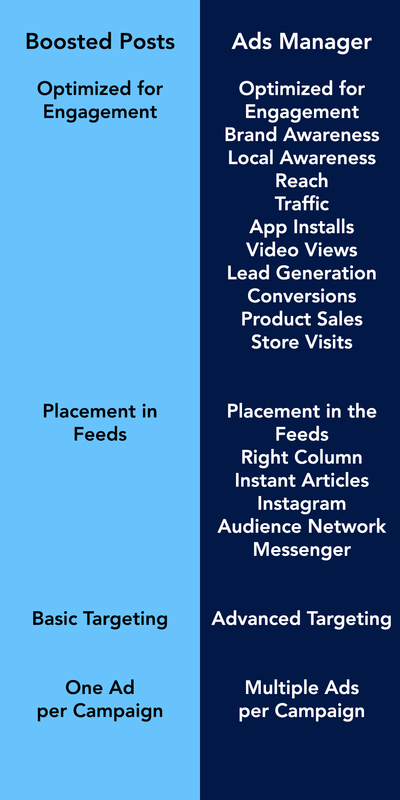 With advanced ad planning, you’re able to pick and choose the placements for your ad or let Facebook optimize your ad placement for the best performing position. More placements mean more eyeballs and more opportunities for your ad to be seen. The targeting available for boosted posts isn’t bad—it’s just incomplete. With boosted posts, you’re limited to targeting by basic demographic info and interests. 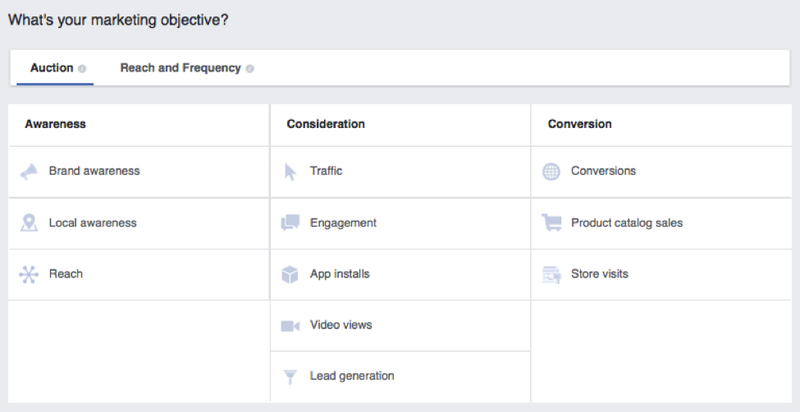 With Ads Manager or Power Editor, you have a lot more data at your fingertips thanks to Facebook’s data partners. In addition to the targeting available through boosted posts, you can also target by behavior, website activity (measured by the Facebook pixel), and customer data you import into the Facebook platform. So, instead of targeting women in Cleveland age 21+ who are interested in yoga, you can target women in Cleveland age 21+ who are interested in yoga OR have recently purchased fitness equipment AND have visited your website EXCLUDING your current customers. Targeting like this allows you to reach a more qualified audience with a more personalized, attention-grabbing message. The creative for your boosted post is the post itself. When boosting a post, you don’t have the option to alter the text or the image—basically, the ad (your post) is already created by the time you decide you want to make it an ad. With Ads Manager or Power Editor, you have much greater flexibility with your ad creative. You can create several different ads in one campaign, allowing you to test the effectiveness of different image or copy options. You can also change your ad creative while a campaign is running, or add or subtract ads from a campaign. Adjusting your creative based on your audience’s response to your ads can help you get the most value out of your campaign. Boosted posts are like Facebook ads with training wheels—they are a good start, but limit your capabilities. Facebook’s more advanced platforms are powerful advertising tools that, when used correctly, can make a big difference for your business. Not sure you want to dive into this on your own? Give us a call and we can manage your perfect social media strategy.